I’m that guy that visits every Mexican restaurant in town to test the margarita and salsa waters. If it doesn’t pass the good chips and salsa test, vámanos! Having just returned from Mexico, I was on a salsa kick. I have a few favorite restaurants here in Nashville that pass my salsalitmus test, but really wanted to nail down a good, fresh salsa recipe to make at home. I did have an insane amount of tomatoes in my back yard, after all. 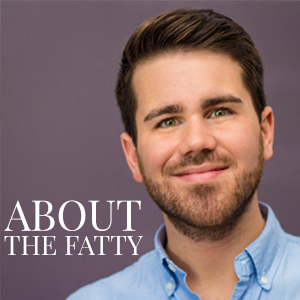 On top of that, I was given a solid 10 pounds to add to it. 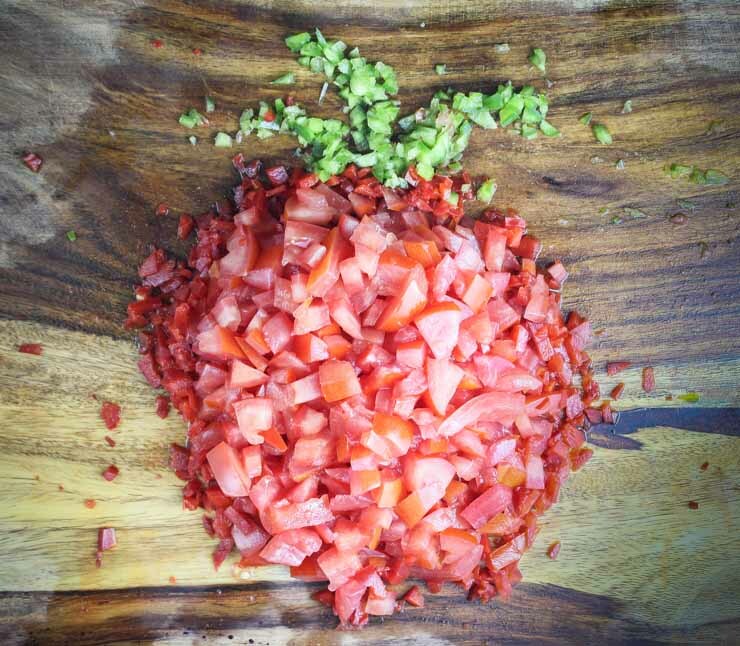 Here is the result– a fresh, simple Homegrown Tomato Salsa recipe. I’ve preached it before, and I’m gonna preach it again. Fresh. Local. There really isn’t any excuse to not take complete advantage of your local Farmer’s Market to stock up on excellent produce. It’s cheaper, of sooo much better quality and certainly accompanied by a much better taste than that of the prematurely harvested commercial variety. Load up the minivan, pack in the kids and go find a local provider to support. I have a very small back patio area and managed to grow a ton of tomatoes. In bucket. Seriously. Enough tomatoes that y’all are welcome to come take a few! 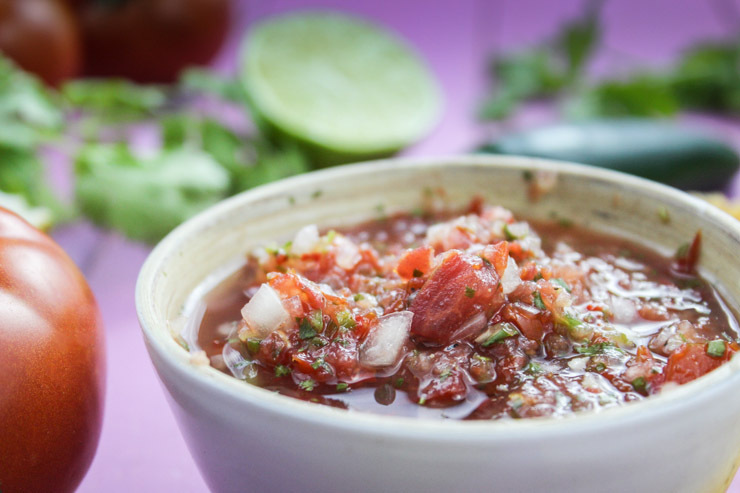 Back to business… One thing that I have noticed when I’ve visited Mexico has been the simplicity of the salsas. You don’t find a lot of the blended, overloaded varieties that are sometimes popular here in the States. It’s mostly fresh tomato, herbs and a kick of spices. Being of those pansies that doesn’t really care for spicy, I almost always go for the most mild varieties. I do love a bit spicy tomatillo twist, though. Making your own, you can really create that perfect balance for your own taste. When I planted all of those buckets of tomatoes and peppers, I ended up with one random plant with these smaller, sorta wrinkly like a hand after swimming, looking peppers. Just an FYI. Ghost peppers are not something you want to grow if you are fait at heart with spicy food. Don’t touch them. Don’t grow them. Dig it up and destroy it. That’s my advice. On a positive note, the rest of the jalapeños and banana peppers are delicious! The jalapeños will get tossed into the mix for this recipe, although I bet the banana peppers would add a nice flare as well. I have to admit… the cilantro that I used in this didn’t come from my back yard. I grew cilantro. I always grow it. It always dies. I somehow accidentally let it bloom and then it has a mind of it’s own. I just give up at that point and let it dry out for coriander. Fighting a flowered cilantro plant is like having a bag of gummy bears laying around while you are on a diet. It’s just doomed to fail. 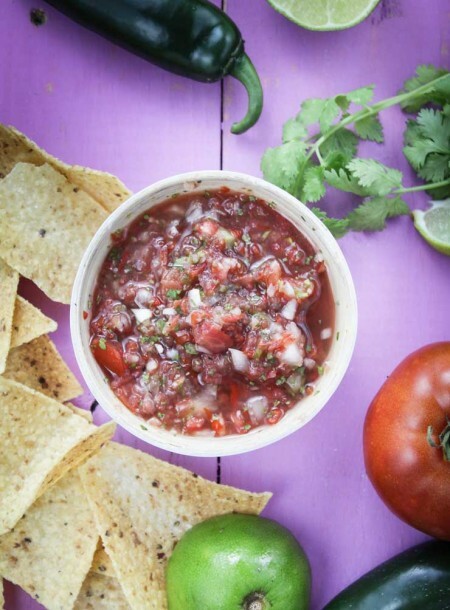 Some fresh lime juice alongside the tomato, onion and cilantro give the salsa a nice tartness to balance the heat from the jalapeño. 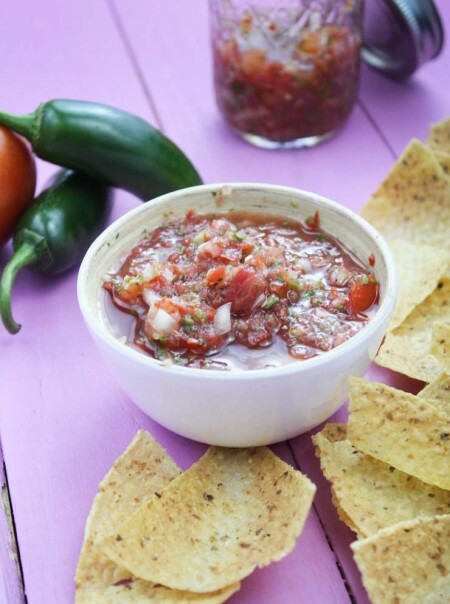 I’m fairly certain that you could can this Mexican magic to keep you full of homemade salsa for the entire winter, although I’m also certain that it won’t stick around long enough to really need to. ¡Enjoy, y’all! This would go perfectly with our Homemade Guacamole for Taco Tuesdays! Add the brown sugar if needed to cut the acidity of the tomato. Best served after a day for flavors to mix. Spicy or mild? What’s your favorite salsa companion? Let us know! In your opinion, who has the best Salsa in Nashville? The pickings are slim here!